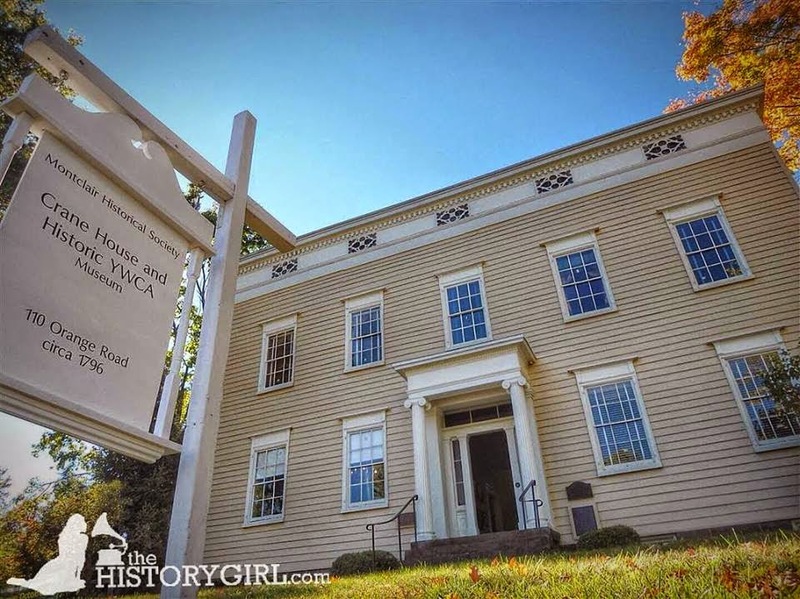 NJ Weekend Historical Happenings: 3/17/18 - 3/18/18 ~ The History Girl! On Saturday, visit Historic Longstreet Farm in Holmdel from 1:00 - 3:00 pm, lovely melodies from the 1890s will be played on the accordion inside the farmhouse. Also from 1:00 - 3:00 pm, view a traditional hand quilting demonstration in the farmhouse. When is a 3/4 ton workhorse a chicken? When the doctor, farrier, and dentist come...maybe. Keeping the horses in tip top shape is very important to our farmers. This annual well visit allows a head to tail examination and is just one of the many ways we can be sure our horses are healthy and happy. Besides seeing some of the tools, techniques and products that relate to horse care as it was practiced during the farm's circa 1900 time period, visitors will be able to meet a veterinarian, horse dentist, and farrier and even try their own hand at a bit of horse doctoring. With the veterinarian's help, visitors will be able to listen to a horse's heart through an antique stethoscope and watch the doctor give spring vaccines and worming medicine. The dentist will need assistance counting teeth to determining the age of the horse and leveling any teeth with a dental rasp. The special hoof care that is needed, will be demonstrated by the farrier, this will include trimming and balancing of hooves and re-set shoes if needed. Travel from inn to inn in Victorian Cape May while you try to solve the new Sherlock Holmes murder mystery for 2018 "Sherlock Holmes and The Case of a Siren's Call" on Saturday from 1:00 - 3:00 pm. Admission: $15 for adults, $7.50 for children (ages 3-12). Tour begins and tickets are available at the Washington Street Mall Information Booth in Cape May, NJ. Part of Sherlock Holmes Weekend, presented by the Mid-Atlantic Center for the Arts & Humanities (MAC). For more information, call 609-884-5404 or 800-275-4278 or visit www.capemaymac.org. Enjoy this entertaining and educational guided tour of Cape May's only Victorian house museum, the 1879 Emlen Physick Estate, with the house tour theme for 2017-18, "Let's Go Shopping! Victorian Consumer Culture." The tour will be held Saturday and Sunday at 11:45 am and 1:00 pm. Admission is $12 for adults and $8 for children (ages 3-12). The Physick Estate is located at 1048 Washington Street, Cape May, NJ. Sponsored by the Mid-Atlantic Center for the Arts & Humanities (MAC). For more information, call 609-884-5404 or 800-275-4278 or visit www.capemaymac.org. Want to find a special place to visit off the beaten path? Come to the Whitesbog Blueberry and Cranberry museum. There are interesting artifacts and detailed farm history to explore. Its charm will appeal to both the young and the young at heart. This museum has a unique understanding of the area, its people and places that make Whitesbog and the Pine Barrens so important to Jersey. Tours available from 10:00 am - 4:00 pm. Call first at 609-893-4646 to arrange for a tour. Donation of $5 per person requested. 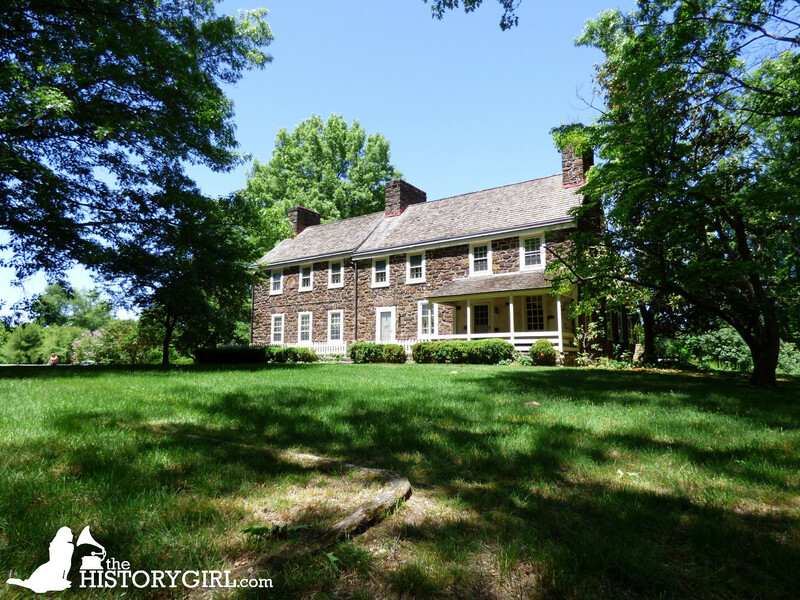 Historic Whitesbog Village is located at 120 West Whitesbog Road, Browns Mills, NJ. It is located at mile marker 13 on County Route 530 (Pemberton Township). For more information, call 609-893-4646, e-mail WhitesbogPreservationTrust@gmail.com or visit www.whitesbog.org. Discover the people whose “many voices” and life stories shaped our community, and travel through the ages with the Crane House and Historic YWCA. Hear about the evolution of our young country from New Jersey’s point of view, and learn of a unique story set during a time when the nation was embroiled in the Civil Rights. Visit our community farm to learn more about our agricultural past, and don’t forget to say hello to our happy brood of chickens! The site at 108 Orange Road, Montlair, NJ is open from 1:00 - 4:00 pm. Tours of the Crane House & Historic YWCA are on the hour, last tour at 3:00 pm. Admission is $6/adult; $5/student/senior with ID; $4/child; under 2 free. For more information, call 973-744-1796, e-mail mail@montclairhistorical.org, or visit www.montclairhistorical.org. One of the seasonal tasks of farm life in colonial days was sugar making in the maple woods. The production of syrup and sugar from the sap of the maple tree is the oldest known industry in America. On Sunday from 2:00 - 4:00 pm, the museum features “Maple Sugar Sunday.” The presenter will talk about the technique of maple sugaring, explaining how the maple sap rises and flows, how it is collected using wooden buckets and handmade spiles, and how sugar and syrup are made from the sap (please note that no tree will actually be tapped). This program is appropriate for children. Sunday's program includes tours and open-hearth cooking demonstrations. Members of the cooking committee will demonstrate the skills used in 18th century open-hearth cooking, using authentic recipes and seasonal foods. The program includes tours of the fully restored circa 1740 farmhouse museum, as well as open-hearth cooking demonstrations featuring using period techniques and recipes. Admission is $4 for ages 13 and older, $3 for ages 3-12, and free age 2 and younger. The Miller-Cory House Museum is located at 614 Mountain Avenue, Westfield, NJ. For more information, call 908-232-1776, e-mail millercorymuseum@gmail.com, or visit www.millercoryhouse.org. Why was tea so important in the lives of 18th century people that fashion-conscious families posed for portraits with their tea sets? Did Great Britain lose her American Colonies over "the cup that cheers"? Find out in this unusual costumed presentation of tea lore, history, songs, poetry, living history display and demonstration on Sunday at 2:00 pm at the Van Horne House in Bridgewater. This program is funded by the New Jersey Council for the Humanities, and is FREE. Due to limited space, the first 50 people registered will be admitted. ​Refreshments will be served, including Bohea tea imported from the UK. The same tea that was tossed into Boston Harbor! Stacy Flora Roth is a freelance museum educator, public speaker, vocalist, and performance artist whose specialty is educational presentations on themes in American History. Ms Roth holds a BA in History from Kean University, an MLS from Rutgers Schools of Library and Information Studies, and an MA from the University of Pennsylvania in American Civilization. To register, click here. The Van Horne House is located at 941 East Main Street, Bridgewater, NJ. Parking available in the Target parking lot directly behind the house. For more information or to register, call 732-356-8856 or visit www.heritagetrail.org. With the 10-foot hearth in the Great Room at Peachfield as the backdrop, Margaret Quinn our Colonial cooking expert will share her knowledge of cooking on the Open Hearth. She will prepare a variety of dishes from authentic Colonial Recipes. Sampling and light refreshments are included. This program will take place from 2:00 - 4:00 pm. Admission is $15 per person. Prepaid reservations are recommended to guarantee seating; seating is limited. Peachfield is located at 180 Burrs Road Westampton, NJ. For more information and to reserve a seat, call 609-267-6996 or e-mail colonialdamesnj@comcast.net. The Passaic County Historical Society would like to announce the opening of its newest exhibit Urban / Rural: Landscapes of Passaic by William P. Campbell (1943-1992). This exhibit is a career spanning retrospective, featuring the landscape paintings of local artist William P. Campbell (1943-1992). A Paterson native formally trained at Newark School of Fine and Industrial Arts and the School of Fine Arts at William Paterson College, Campbell spent his life painting the landscapes of Northern New Jersey, while working as a letter carrier for the United States Postal Service in Passaic. This exhibition of Campbell’s work focuses on the urban landscape of the City of Passaic. Many of the pieces reflect Campbell's interest in how industry and urban development mingle with, and sometimes overwhelm, the natural beauty of the Passaic River. The paintings will be on display in Lambert Castle through March 25, 2018. The exhibit is located on the 3rd floor of the museum and can be viewed as a part of the self-guided museum tour. Regular admission applies (adults $5, seniors $4, and children $3). 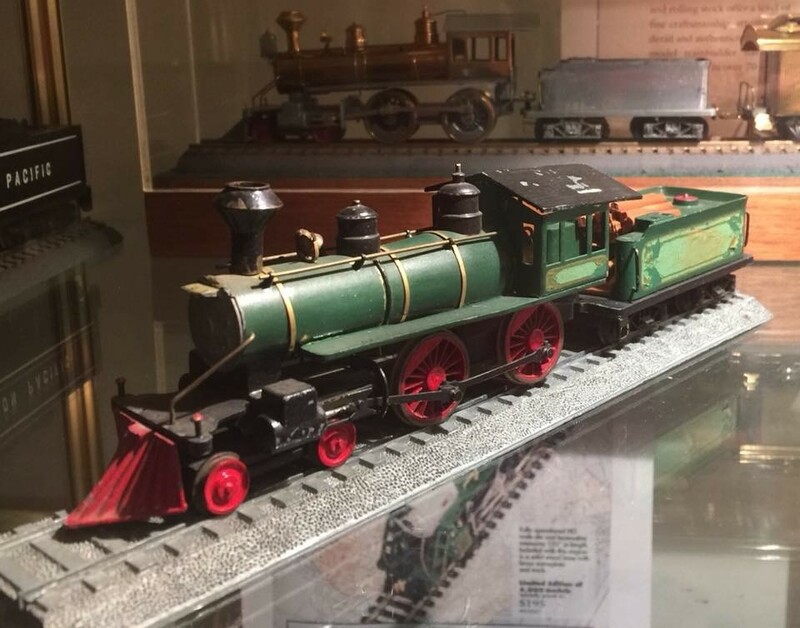 All Aboard…Trains!, our new exhibit at the Gloucester County Historical Society Museum, will be a hit for the whole family! The main attraction will be the running train displays throughout the museum. Also featured will be the extensive Tyco Train collection which was once the private collection of the Tyler family, founder of Tyco. Railroad memorabilia from throughout the years will also be on display, in addition to vignettes from Victorian times to the 1950’s. This exhibit will run until March 30, 2018. The Gloucester County Historical Society Museum hours are Monday, Wednesday, and Friday from 1:00 - 4:00 pm, and the last Sunday of the month from 2:00 - 5:00 p.m. If interested in scheduling a private tour during non-public hours to see this exhibit, this may be organized for you and/or your group with advance notice. Regular admission from January - March: Adult admission $5; children 6-18 years $1; children under 6 free. The Gloucester County Historical Society Museum is located at 58 N. Broad Street, Woodbury, NJ 08096. For more information, call 856-848-8531 or visit www.gchsnj.org. Until Sunday, April 15, view the Center for Community Arts (CCA) Exhibit in the Carroll Gallery on the grounds of the Emlen Physick Estate, 1048 Washington Street, Cape May, NJ. From its opening in 1928, the Franklin Street School was a symbol of segregation and separation. It stood as a reminder of a racial divide, even after school integration in 1948. For two decades the Center for Community Arts has worked to preserve, stabilize and restore the school. 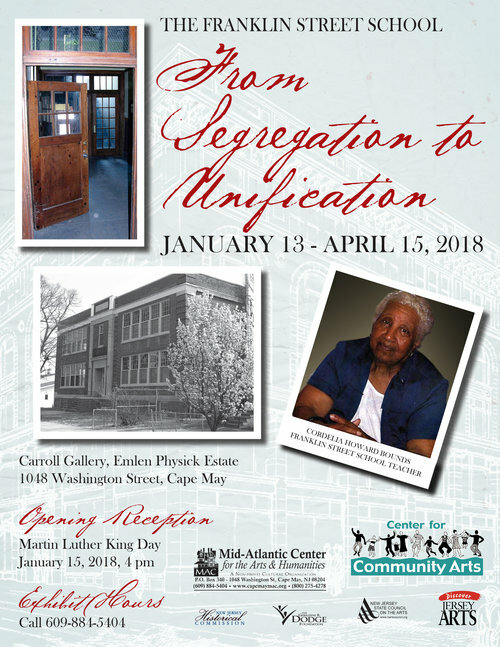 Now a collaborative effort by CCA and the City of Cape May aims to renew the school as a community center, offering meeting space, arts and history programs, exhibits, events and senior activities and services to bring together all the people of Cape Island. The exhibit will include photographs, artifacts and recorded oral and video histories to chronicle the history of the school, the initial efforts to preserve and rehabilitate the building, and plans for the building’s expansion and completion. Admission to the exhibit is free. Presented by the Center for Community Arts (CCA) in association with the Mid-Atlantic Center for the Arts & Humanities (MAC). For information on the exhibit, call 609-884-7525 or visit www.CenterforCommunityArts.org. For gallery hours, call 609-884-5404 or visit www.capemaymac.org. The American Labor Museum/Botto House National Landmark located in Haledon, New Jersey proudly has opened the exhibit Frederick Douglass Series 2017. Frederick Douglass Series 2017 is an exhibit of contemporary paintings and drawings about the life of Frederick Douglass, slave, abolitionist, and statesman. 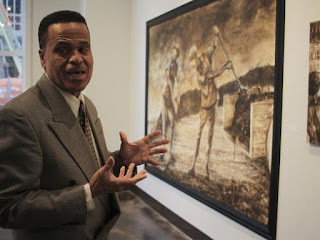 Artist Mark Priest states, "In the United States of America many slaves were safely carried to freedom. This monumental undertaking that has virtually gone unnoticed has been the subject of my work over the past eleven years. My current focus is on Frederick Douglass, Slavery in Maryland, and Underground Railroad Conductor, Harriet Tubman." Mark Priest is a working artist and professor at the University of Louisville in Louisville, Kentucky. Mr. Priest graduated from Yale School of Art in 1989. He is a productive artist with exhibition experience and, he continues teaching studio art to college students. Frederick Douglass Series 2017 exhibit by Mark Priest is on view at the museum through April 28, 2018. The American Labor Museum is headquartered in the historic Botto House National Landmark, located at 83 Norwood Street, Haledon, NJ. The museum's hours of operation are Monday through Friday 9:00 am - 5:00 pm. Tours are offered Wednesday through Saturday from 1:00 - 4:00 pm or by appointment. For more information, call 973-595-7953, visit www.labormuseum.net or e-mail labormuseum@aol.com. Morven Museum & Garden presents A Gentleman’s Pursuit: The Commodore’s Greenhouse, which reveals the remarkable findings at Morven from Hunter Research’s excavation of one of New Jersey’s earliest greenhouses on view from through June 3, 2018. Research done in the 2000s, revealed that Commodore Robert F. Stockton (1795-1866) had built the greenhouse during his tenure at Morven. Account books showed that the Commodore had paid for the installation of gutters on the building in October 1854, placing its construction at approximately 1852-54. An inventory upon his death indicated that the greenhouse contained 15 lemon trees, 100 Japonicas, 10 cati, 4 azaleas, 3 Daphnes and “Misc. plants.” Based on research it is believed that the greenhouse was torn down in the 1880s. Little else was known about the greenhouse until a 2013 archaeological dig conducted by Hunter Research, Inc., who is partnering with Morven for his exhibition, uncovered the brick and stone foundation of the structure. Excavations over the next two summers revealed thousands of cultural artifacts, including the remains of the cast iron furnace which heated the greenhouse, and glass from the window panes that allowed sunlight in. The greenhouse denotes the refined gentleman’s pastime of the Commodore, reflecting his social prominence and financial standing to enjoy such an exquisite hobby. Due to New Jersey’s gradual emancipation law, the Commodore no longer owned any enslaved people by the time the greenhouse was constructed. The maintenance of the structure and plants within was likely left to a trained gardener and paid farm hands. “This exhibition is unique in that it allows visitors to follow the process of archaeologists and historians as they work their way from identifying archaeological digs, unearthing and dating artifacts, researching primary documents, and comparing contemporaneous sites to reveal a fuller picture of what Morven’s greenhouse would have been like,” says, Elizabeth Allan, Curator of Collections & Exhibitions. “The exhibit shows how archaeology opens a fascinating window into the greenhouse that serviced Morven’s gardens,” says Richard Hunter, President/Principal, Hunter Research, Inc. For the past 30 years, Trenton-based Hunter Research, a historic preservation and cultural resources consulting firm, has been actively engaged in interpreting historic sites for the benefit of the general public. A Gentleman's Pursuit: The Commodore’s Greenhouse is on view at Morven Museum & Garden, 55 Stockton Street, Princeton, NJ, through June 3, 2018. Admission: Adults - $10, Seniors (60+)/Students/Active Military Personnel - $8, Children 6 and under - Free, Friends of Morven - Free. Morven’s Hours: Wednesday through Sunday, 10:00 am - 4:00 pm. For more information, call 609-924-8144 or visit www.morven.org.